with the DIR-615 will cause damage and void the warranty for this product. video streaming, online gaming, and real-time audio. duration of hours or minutes. can securely access corporate networks. conditions will adversely affect wireless signal range. its original factory default settings. to the cable or DSL modem. Ethernet-enabled computer on ports 1-4. This LED blinks during data transmission. router in an enclosed area such as a closet, cabinet, or in the attic or garage. the modem back on. In some cases, you may need to call your ISP to change connection types (USB to Ethernet). so that the number of walls or ceilings is minimized. of at an angle) for better reception. (fish tanks), mirrors, file cabinets, brick, and concrete will degrade your wireless signal. guide you quickly through the installation process. in WindowsВ® XP. The steps and screens are similar for the other Windows operating systems. вЂњD:\DIR615.exeвЂќ (where D: represents the drive letter of your CD-ROM drive). When the autorun screen appears, click Install Router. Note: It is reccomended to write down the login password on the provided CD holder. refer to the Troubleshooting section for assistance. You may click Setup Wizard to quickly configure your router. Manual Configuration and skip to page 16. Click Launch Internet Connection Setup Wizard to begin. Security Setup Wizard and skip to page 49.
host name is the device name of the Router and may be changed. provider. Click Next to continue. password. Click Next to continue. click Continue. Please allow 1-2 minutes to connect. Close your browser window and reopen it to test your Internet connection. It may take a few tries to initially connect to the Internet. address of your Ethernet card. your specific ISP. 1500 is the default MTU. software from your computer. The software is no longer needed and will not work through a router. portвЂ™s MAC address with the MAC address of your Ethernet card. Connect Mode: Select either Always-on, On-Demand, or Manual. a username and password. This option is typically used for DSL services. Account: Enter your PPTP account (username). Time: maintained during inactivity. To disable this feature, enable Autoreconnect. L2TP Subnet Mask: Enter the Subnet Mask supplied by your ISP (Static only). Account: Enter your L2TP account (username). appropriate IP form, which are four octets separated by a dot (x.x.x.x). The router will not accept the IP address if it is not in this format. ISP Gateway: Enter the Gateway assigned by your ISP. default MAC address unless required by your ISP. with the MAC address of your Ethernet card. specific ISP. 1500 is the default MTU. BigPond Server: Enter the IP address of the login server. BigPond Username: Enter your BigPond username. the password in the next box. the MAC address of your Ethernet card. Wireless Network Service Set Identifier (SSID) is the name of your wireless network. Name: Create a name using up to 32 characters. The SSID is casesensitive. Scan, this option will be greyed out. Channel Scan: DIR-615 to choose the channel with the least amount of interference. Mixed 802.11b/g - Select if you are using both 802.11b and 802.11g wireless clients. Mixed 802.11b/g/n - Select if you are using a mix of 802.11b, 11g, and 11n wireless clients. Wireless Security: Refer to page 47 for more information regarding wireless security. browser to get back into the configuration utility. ending address of the IP address pool. Server: your router. Uncheck to disable this function. Range: the DHCP serverвЂ™s IP assignment. or you may have an IP conflict. Lease Time: The length of time for the IP address lease. Enter the Lease time in minutes. If you want a computer or device to always have the same IP address assigned, you can create a DHCP reservation. The router will assign the IP address only to that computer or device. drop-down menu and click <<. within the DHCP IP Address Range. IP address can be automatically redirected to local servers in the LAN (Local Area Network). service request to the appropriate server within the LAN network. different port on the server computer. use that particular virtual service. This will allow you to open a single port. If you would like to open a range of ports, refer to page 28.
in the Tools > Schedules section. click << to populate the fields. Traffic Type: Select the type of protocol you would like to assign to the rule. particular service to always be enabled. You can create your own times in the Tools > Schedules section. UDP, then enter the firewall (public) ports associated with the trigger port to open them for inbound traffic. you want to use and enable it. may define a single port or a range of ports. create your own times in the Tools > Schedules section. clients that are currently connected to the Broadband Router. and click Save Settings. The text to be blocked will appear in the list. To delete the text, click Clear the List Below. completely to the outside world. the DMZ machine does not change. VPN Passthrough: You may enable or disable the following listed VPN protocols. Tx Rates: manually set the TX rate. synchronize a wireless network. Specify a value. 100 is the default setting and is recommended. minor modification should be made. preamble is recommended for a large amount of network traffic such as transferring files or streaming audio or video. networks 802.11n performance. This option is available only when 802.11 mode is set to 802.11n only. to allow the Internet port to be вЂњpingedвЂќ. streams: through the router from the Internet. settings and not be able to make changes. browse the built-in web pages to perform Administrator tasks. * to allow a connection from any internet address. Port: The port number used to access the DIR-615. be configured to automatically adjust the time when needed. Internet, not a local server. time the router was shipped from the factory. your domain name to connect to your server no matter what your IP address is. down menu and click the << button. Username or Key: Enter the Username for your DDNS account. Password or Key: Enter the Password for your DDNS account. icon to remove the schedule. and the firmware version of the router. displayed. Use Release to disconnect from your ISP and use Renew to connect to your ISP. Disconnect to drop the PPPoE connection and use Connect to establish the PPPoE connection. IP settings for the router. wireless settings such as SSID and Channel. This page displays the log events of the DIR-615. Here you can view the logs of the router. Clear: Clears all current log content. time and MAC address of the connected wireless clients. from one wireless device to another. characters 0-9, A-F) or ASCII (American Standard Code for Information Interchange вЂ“ alphanumeric characters) format. for use over the network. Four keys can be defined so that you can change keys easily. encryption system to ensure that only authorized network users can access the network. be the exact same key entered on your wireless router or access point. more secure public key encryption system to ensure that only authorized network users can access the network. click Launch Wireless Security Setup Wizard. 32 characters. The SSID is case-sensitive. characters or 26 Hex (A-F, 0-9) characters). WEP Key to enter on your wireless clients. Pre-Shared Key to enter on your wireless clients. Settings on the left side. 2.Next to Security Mode, select WEP. 3.Next to Authentication, select Shared Key or Open. 6.Next to WEP Key 1, enter a WEP key that you create. devices. You may enter up to 4 different keys. and enter the same WEP key as you did on the router. 3.Next to WPA Mode, select Auto, WPA2 Only, or WPA Only. connectivity until you enable WPA-PSK on your adapter and enter the same passphrase as you did on the router. Auto if you have wireless clients using both WPA and WPA2. a client is required to re-authenticate (60 minutes is default). 7.Next to RADIUS Server Shared Secret, enter the security key. 10. Click Apply Settings to save your settings. similar to the WindowsВ® XP utility as seen below. on the center of the bubble to access the utility. you are joining an existing network, you will need to know the WEP key being used. same WEP key that is on your router and click Connect. WEP key must be exactly the same as on the wireless router. WPA-PSK passphrase and click Connect. connection fails, please verify that the WPA-PSK settings are correct. the Internet or have to be connected to the Internet. The device has the utility built-in to a ROM chip in the device itself. help files included with your firewall software for more information on disabling or configuring it. click the button to restore the settings to their defaults. button. Make sure nothing is checked. Click OK.
bar. This should open the login page for your the web management. paperclip to hold the button down for 10 seconds. Release the button and the router will go through its reboot process. admin and leave the password box empty. Hotmail, we suggest lowering the MTU in increments of ten (Ex. 1492, 1482, 1472, etc). be another computer, or a URL. it. You will be able to enjoy the freedom that wireless networking delivers. to be beneficial for many users. and desktop systems support the same protocols as Ethernet adapter cards. used to provide this link. D-Link is the worldwide leader and award winning designer, developer, and manufacturer of networking products. Local Area Network (WLAN), and Wireless Personal Area Network (WPAN). campuses, airports, golf courses, and many other outdoor venues. up to 30 feet away. speakers, and other devices that operate on batteries. business, D-Link has a wireless solution for it. connection in public places is usually called вЂњhotspotsвЂќ. locations like: Airports, Hotels, Coffee Shops, Libraries, Restaurants, and Convention Centers. to place the router/access point as high as possible in the room, so the signal gets dispersed throughout your home. If you have a two-story home, you may need a repeater to boost the signal to extend the range. on the WPA or WEP security feature on the router. Refer to product manual for detail information on how to set it up. вЂўInfrastructure вЂ“ All wireless clients will connect to an access point or wireless router. adapters on each computer, such as two or more DIR-615 wireless network Cardbus adapters. to the wireless router or access point. DHCP server (i.e. wireless router) automatically. To verify your IP address, please follow the steps below. or administrator to verify their wireless network settings. WindowsВ® XP - Click on Start > Control Panel > Network Connections. WindowsВ® 2000 - From the desktop, right-click My Network Places > Properties. Internet port on the router. 9. 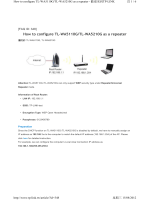 Refer to page 11 to configure your router. accept a DHCP address from your other router. 1. Plug the power into the router. Connect one of your computers to the router (LAN port) using an Ethernet cable. which case you will not have to do anything to your computer. name to Admin and leave the password box empty. Click Log In to continue. browser and change your computerвЂ™s IP settings back to the original values as in Step 1.
anything into the Internet port of the D-Link router. Wireless Security sections for more information on setting up your wireless network. factors will adversely affect wireless signal range. U.S. and Canadian customers can contact D-Link technical support through our web site or by phone. вЂў Serial Number (s/n number located on the label on the bottom of the router). and answers to technical issues. вЂў Only for products purchased and delivered within the fifty states of the United States, the District of Columbia, U.S. Possessions or Protectorates, U.S. Military Installations, or addresses with an APO or FPO. (вЂњWarranty PeriodвЂќ), except as otherwise stated herein. by D-Link, or for which the purchase price is refunded, shall become the property of D-Link upon replacement or refund. thereof) is first returned to D-Link. The license granted respecting any Software for which a refund is given automatically terminates. stated herein to the contrary. as a copy of the dated purchase invoice for the product) if the product is not registered. portion of the product and will not ship back any accessories. D-Link not to be defective or non-conforming. sales or other sales in which D-Link, the sellers, or the liquidators expressly disclaim their warranty obligation pertaining to the product. D-Link Service Office. Improper or incorrectly performed maintenance or repair voids this Limited Warranty. SUCH IMPLIED WARRANTY SHALL BE LIMITED TO THE DURATION OF THE APPLICABLE WARRANTY PERIOD SET FORTH ABOVE. SELECTION AND PERFORMANCE OF THE PRODUCT IS WITH THE PURCHASER OF THE PRODUCT. ARE EXCLUSIVE AND ARE IN LIEU OF ANY OTHER WARRANTIES OR REMEDIES, EXPRESS, IMPLIED OR STATUTORY. or consequential damages, or limitations on how long an implied warranty lasts, so the foregoing limitations and exclusions may not apply. This Limited Warranty provides specific legal rights and you may also have other rights which vary from state to state. stipulated by the United States Copyright Act of 1976 and any amendments thereto. Contents are subject to change without prior notice. Copyright В©2006 by D-Link Corporation/D-Link Systems, Inc. All rights reserved. and operated with minimum distance 20cm between the radiator & your body. We declare that the product is limited in CH1~CH11 by specified firmware controlled in the USA. prohibited per regulations of Industry Canada. The required antenna impedance is 50 ohms. 20cm between the radiator & your body. 1) Ce pГ©riphГ©rique ne doit pas causer dвЂ™interfГ©rence et. The Class [B] digital apparatus meets all requirements of the Canadian Interference-Causing Equipment Regulation. Cet appareil numerique de la class [B] respecte toutes les exigences du Reglement sur le materiel brouilleur du Canada.